Have you ever been dumpster diving (or 'skipping' as it is known in British parlance)? NO? Well, neither have I. But as I begin my week of living below the line, I am sorely tempted. Perfectly edible veg, slightly stale bread, an apple or twelve with bruises. With a limited budget, a supermarket dumpster sounds like a god-send. You've probably heard the figures by now, from me or some other, that at least one-third and up to half of all food goes to waste globally. Now in the poorer countries of the world, where the economy is still largely based around agriculture, that loss happens somewhere between the field and market, due to spoilage or lack of market access. But this waste is felt particularly keenly by urban poor in the western world, as the greatest portion is tossed by retail chains or by consumers themselves. Let's take Tesco, the bargain grocery giant that happens to be supplying my food for the week. Earlier this year, they made news by announcing that the chain wasted nearly 30,000 tonnes (equivalent to 30 million kg or 66 million lbs) of food in the first half of 2013! About 20% of that was from produce and another 40% from the bakery. The interesting bit is that Tesco readily made this information public, implementing measures to reduce the waste within their supply chain (such as theoretically pulling 'multi-buy' specials) as well as educating consumers about proper storage to reduce spoilage. While my overall opinion of UK grocery chains is pretty low, I've actually been quite surprised by the wide acceptance of food mark-downs - anything from cakes to veg to meat - that have reached their pull-by dates but have another couple days shelf-life. Another major (this time US-based) chain made headlines late last year, when the former president of Trader Joe's decided to start a new enterprise with perfectly edible, but slightly past sell-by, food. The model is to sell produce and prepared foods from these unwanted products, and specifically target underserved and marginalised areas. In an interview, Doug Rauch noted that part of the problem is simply misconception and misinterpretation. A "sell-by" date of October 1st doesn't mean that a product is inedible on the 2nd. If it looks fine, smells fine, and feels fine (maybe don't eat a disintegrating carrot...), it is more likely than not just fine to eat. So, while the average UK family loses nearly £700 on tossed food a year, for the next week wasting food should not be much of an issue for me. But the larger issue of waste within the food system very much affects those eating at the poverty line - influencing food prices and availability. It's a mentality of disregard for efficiency and moderation that currently pervades our society, but will become less and less feasible as time goes on. Good to see there are already counter efforts in place! Moving on to the week ahead. For the past two years, I have developed a plan of attack for the Live Below the Line Challenge. The first year I went heavy on the whole grains and legumes (which tend to be cheap and filling), resulting in mid-week appetite loss and necessary adaptation that wouldn't have been possible had I really lived in poverty. Last year, I sacrificed some calories for extra veg, and it worked out pretty well, despite some hunger pangs. While my actual grocery list didn't change too much from last year, this year the price ranges were a bit challenging to get used to (not to mention mentally calibrating to £1 vs. $1.50 per day). So what do I have to work with? Stay tuned for a daily update on how I'm fairing, and some interesting tidbits related to poverty and hunger. I'm also over half-way to surpassing my fundraising goal! Consider donating to the Rainforest Foundation's efforts to tackle inequity, povery, and food insecurity among tropical indigenous peoples. 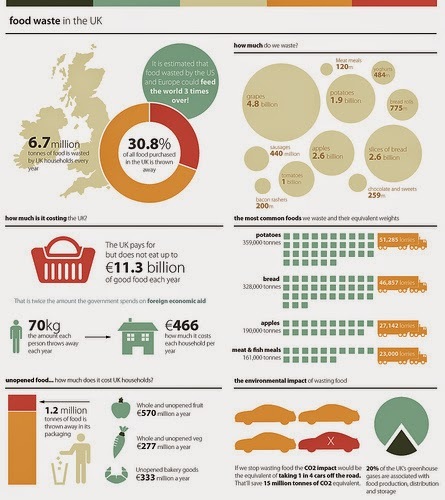 Want more on food waste? Two articles out last week from Grist and the International New York Times. Infographic courtesy of Tiffany Farrant/Flickr.